The embattled Ferguson Police Chief Tom Jackson resigned on Wednesday, one week after a damaging federal report highlighted instances of systemic racism within the Ferguson Police Department and seven months since the fatal shooting of 18-year-old Michael Brown by Officer Darren Wilson. Jackson, who has only served as the department's chief for five years, will officially leave his post on March 19. 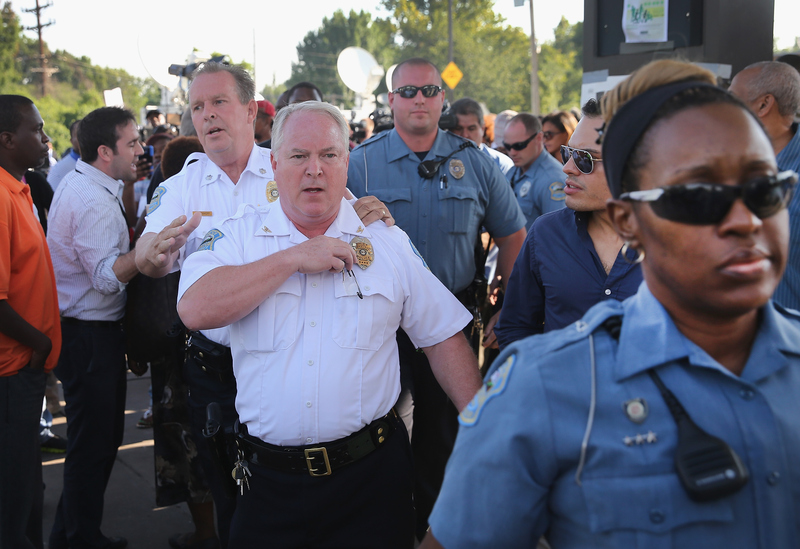 However, he will still receive health benefits and a severance payment, the city of Ferguson said in a statement. Although the police chief's resignation is part of a mass exodus of Ferguson city staff members, including heavily criticized city manager John Shaw on Tuesday, some believe Jackson's departure couldn't come soon enough. The police chief has been publicly condemned since Brown's death reached the national stage in August, triggering months-long peaceful protests, disruptive riots, and civil unrest in the small St. Louis suburb. Many of us have been calling for his resignation for many months now, and after the DOJ report and some of the specific details of how his department operated ... It frankly was a matter of time. Following news of Jackson's resignation on Wednesday, French began tweeting #ChiefJacksonHighlights, reminding everyone of the police chief's missteps over the last seven months. From the very beginning, Jackson and his department responded improperly, French alleges. The alderman calls out the chief's decision to issue heavy artillery to quell the crowds that formed a couple hundred feet from Brown's body on that fateful afternoon in early August. French also posted a Vine video of his arrest at a protest in Ferguson on Aug. 13. French was released the following morning, with no charges. The alderman's arrest made national headlines, but he was hardly the only person wrongly arrested during the August protests, which quickly turned into a disturbing spectacle of police militarization. Several journalists, including The Washington Post's Wesley Lowery and Ryan Reilly of the Huffington Post, were detained by Ferguson police officers while simply doing their jobs: reporting. At the time, Jackson told CNN he did not know who the arresting officers were or why Lowery and Reilly were arrested, already raising doubts about the chief's leadership. The multiple arrests of journalists even received criticism from President Obama, who reiterated in a press conference last August that "police should not be bullying or arresting journalists" in America. They also coincided with the Ferguson and St. Louis County police departments' use of excessive force, including firing off tear gas and rubber bullets to subdue protests. The use of such force, particularly when a good deal of the protests remained peaceful and lawful, also drew some ire from the president, as the scenes filtering out from Ferguson continued to shock the nation. Considering all that we've witnessed since Brown's death on Aug. 9, it's hard to believe that it has taken this long for Jackson to resign. After all, it was barely a week since the fatal shooting when Jackson lost control of his city, relinquishing security to Missouri State Highway Patrol and its more affable leader, Capt. Ron Johnson. Others also believe that Jackson seemed to lack empathy for Brown's death and for his family. The police chief released an apology to the Brown family two weeks after the African-American teen's death — a move for which Jackson was criticized by the Ferguson community. He also prematurely released a report about Brown allegedly stealing cheap cigars from a convenient store — a move that was condemned as an attempt to smear the 18-year-old's character. To be sure, not all of the problems surrounding the Ferguson protests early on were Jackson's fault. With other police departments called in to help police the suburb, Jackson was not the only one authorizing use of tear gas or rubber bullets, nor calling for unjust arrests. But why did it take Jackson seven months before he taking accountability? Although he may be leaving next week, Jackson lost his city during those restless, violent nights in August.